The third most populated city in Western Canada is home to over half a million people. Vancouver is a trendy city surrounded by a breathtaking natural backdrop, where densely urbanized areas alternate with the Zen environment of the landscape. Surrounded by the North Shore Mountains and Mount Baker the urban landscape seems to have emerged from the water. Dubbed Hollywood North the hip, urbane setting has been attracting film makers from south of the border. The city landscape is an eclectic mix of modern, neoclassical, Victorian, Gothic and Art Deco architecture. Vancouver has been the second destination for immigration after Toronto, the local colour and human landscape reflect an ethnically-diverse population. Favourite tourist destinations include Stanley Park, the VanDusen Botanical Garden and Queen Elizabeth Park. Pacific Ocean whale watching is very popular in this part of Canada. Vancouver’s vast collection of totem poles is among the most important in the world. It is a testament of the heritage and role of the First Nations peoples. The average rate for tips in Vancouver is 15%. Most prices on retail goods and services generally do not include taxes, you must add a 12%-15% Harmonized Sales Tax (HST) to all taxable items (restaurants, services, hotels, souvenirs, tours, etc.). Anyone entering night clubs, restaurants and music venues where alcohol is served in Vancouver must show proper identification proving the legal drinking age (19). Two (2) pieces of ID are required. Vancouver’s public transportation, Sky Train station is located in the city centre, where most downtown hotels are also conveniently located. Downtown Vancouver, at Granville Street between Robson Street and West Georgia Street, is within walking distance of the Vancouver Art Gallery and the Granville Shopping Mall. The City of Vancouver is a conglomeration of neighbourhoods. 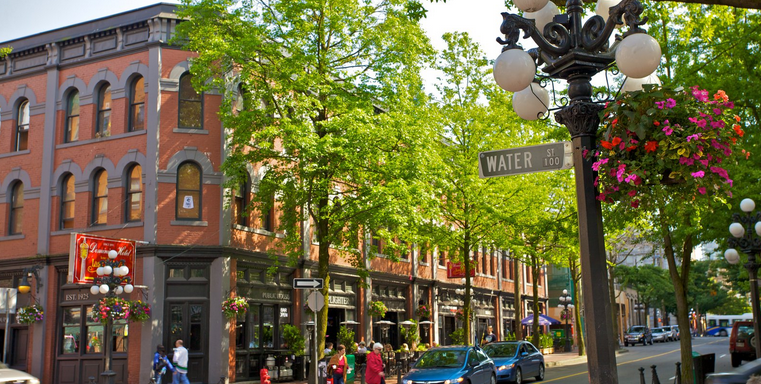 Gastown is the original settlement, the cobblestone streets are a testament of the city’s heritage. High rise offices, residential and commercial buildings make up a good portion of Downtown Vancouver. Restaurants and entertainment venues are clustered around this area. Vancouver’s Chinatown is on Pender Street. As with other areas of the city, Coal Harbour has been redevelopedr. West Vancouver incorporates Yaletown, the financial district and Coal Harbour. Formerly Vancouver’s industrial area, Yaletown has re-emerged as a sleek neighbourhood with high rise buildings, marinas and converted heritage buildings. Vancouver’s Eastside is a derelict area that has seen better days, but it does not lack character. Today the early 20th century buildings in the area have become the dwellings of the city’s homeless. North Vancouver is separated by the Burrard Inlet, it is accessible from the Lions Gate Bridge. The city of Vancouver lies on the west coast of Canada in the province of British Columbia. Occupying part of British Columbia’s Lower Mainland and part of the Lower Fraser Valley, Metropolitan Vancouver includes urban and suburban areas like Hope, Bowen Island, Squamish and Whistler. It should not be confused with Vancouver Island which is a 460-kilometre (290 miles) island northwest of Washington State and it is home to British Columbia’s capital city, Victoria. For thousands of years the area had been the home of aboriginal peoples until the 1700s when Europeans made their way to the Americas in search of natural resources. Many areas were explored by the Spanish it was Captain George Vancouver who charted regions of the Pacific Coast and gave his name to a number of geographic locations. This was a coveted area for explorers, adventurers and gold diggers who travelled in search of furs and gold. When they arrived Vancouver was a jewel in the rough and explorers found themselves in a fairy tale setting of lakes, rivers and valleys surrounded by snow-capped mountains. Energized by their enthusiasm and the prospect of becoming rich, thousands of explorers flocked to the area during the 1858 Gold Rush. Shortly after its incorporation in 1886 Vancouver was destroyed by a devastating fire, levelling the city to the ground. It was rebuilt and repopulated in record time. From a scant 1,000 people in 1881 it rapidly grew to 100,000 by the early 1900s. Over the years it has grown into one of the most liveable cities in the world. Vancouver’s coastal location is largely responsible for the area’s warmer climate, with respect to other Canadian cities.With an average low of 1.4 C, Vancouver winters are “warm” by Canadian standards. There are about 11 days of snowfall. Summer temperatures are dry and average a comfortable 22 ºC (72 ºF). Vancouver experiences its heaviest rainfall season from November through March making it one of the wettest cities in Canada. Staying abreast of the Vancouver weather forecast is very useful when visiting Vancouver. The grey squirrels in Vancouver’s Stanley Park are the descendents of several squirrels “imported” from New York City in 1909. According to popular belief, a dinosaur-like creature lives in Lake Okanagan. Named “Ogopogo” the creature is much like the Loch Ness monster in Scotland. Ogopogo is a legally-protected species and tourists flock to Lake Okanagan hoping to spot the animal. Vancouver International Airport (YVR) is located in Richmond, about 12-15 km from downtown Vancouver. The airport has 3 terminals. Thousands of passengers who pass through the airport are greeted by the vast collection of totem poles and native sculptures in the interior. A flight to Toronto is roughly 4 hours and 20 minutes, and 4 hours and 35 minutes from Montreal. From Vancouver you can reach Seattle– Tacoma Airport in 2 hours and 42 minutes. The oldest company operating in the city of Vancouver is the Yellow Cab Company Ltd. These cabs are present at the Vancouver Airport and are located at Level 2 of the International and Domestic arrivals. The average taxi fare from the airport to downtown Vancouver is about CAD$35 (including tax). You can find wheelchair accessible vehicles in the same area. Conveniently located between the international, domestic flights, arrival and departure terminals, Canada Line station connects the airport to downtown Vancouver in less than half an hour. The ride to downtown Vancouver is about 20 minutes with trains departing every 10 minutes. A single fare allows for hop-on-and-off rides up to 90 minutes across the Lower Mainland. Fares are calculated on a more or less complex system of city zones. Day passes allow unrestricted travel across multiple zones all day and cost CAD$9.00. An additional CAD$5 is levied for train departures from the airport (except for holders of Day Passes, Fare Cards, Fare Saver Tickets, U-Passes, Employer Passes and BC Government Bus Passes). Public transportation in Metro Vancouver is owned by Trans Link. Single bus fares (exact change if paying by cash) are valid for 90 minutes. Ticket vending machines accept up to $20 in cash, debit and credit cards. Regular adult fares: zone 1- CAD$2.75, zone 2 – CAD$4.00, zone 3 – CAD$5.00. Adult fares are CAD$2.75 in all zones after 6:30 pm, all day Saturday, Sunday and on holidays. Fare Saver ticket booklets of ten tickets cost CAD$21.00 for zone 1, CAD$31.00 for zone 2 and CAD$42.00 for zone 3. A DayPass (CAD$9.75) provides unlimited transit use on all buses, SkyTrain and SeaBus services for the day for travel across multiple city zones. Purchase passes at ticket machines (TVM) or at retailers like Safeway, 7-Eleven, London Drugs and Mac’s. Monthly Passes cost CAD$91.00 for zone 1, CAD$124.00 for zone 2 and CAD$170 for zone 3. Trans Link also operates Sky Train Vancouver. The rapid transit operates on elevated tracks that provide city vistas as passengers travel across Vancouver. Visit the Trans Link website for information about public transportation routes, Vancouver bus schedule, fares and passes. Vancouver International Airport has its own licensed sedan, SUV and limousine service. The rates have been divided according to city zones and do not include taxes and tips. Rates* start at CAD$34 and increase according to vehicle, number of passengers and zone. There are three long distance bus connections from Vancouver that connect Vancouver International Airport to Whistler, Victoria/Vancouver Island and Washington State, U.S.A. The airport website has a very useful step-by-step guide to help passengers reach the YVR Whistler SkyLinx bus terminal that connects Whistler and Squamish in about 2 hours. Adult one-way fare is $65.00. Fares are in Canadian dollars and do not include taxes. Pacific Coach Lines connect passengers to Victoria and Vancouver Island via the YVR Victoria Link. Adult one-way fare to downtown Victoria is CAD$46.00, seniors pay CAD$33.95, students CAD$26.95, children CAD$23.00. The train ride is about 3 hours. If you are headed south of the border the Quick Shuttle will get you to Seattle in a few hours. Adult one-way fare to downtown Seattle is $43.00. All the major Vancouver car rental companies like Budget, Hertz, and Thrifty are present at the Vancouver Airport. They are located on the ground floor parking area. A 48-hour advance booking is always a good idea to ensure availability of vehicles. A number of hotels in the Metro Vancouver area of Richmond offer shuttle bus service to and from Vancouver International Airport. There are direct dial phones located in the Arrivals Level 2 section of the airport. Designated pick up areas with the green canopy are outside the Arrivals Level 2 International Terminal Building and outside the Arrivals Level 1 Domestic Terminal Building. Car sharing is extremely common in Vancouver and there are at least 3 organizations with approximately 1,000 vehicles zipping around Vancouver. Modo co-op, Zip Car and car2go offer a range of plans, memberships and vehicles. There are monthly memberships, hourly rates, one-time refundable share purchase rates, co-op and casual member fees and rates, per kilometre rate, and so forth, for long term members and occasional drivers. British Columbia’s prohibitionist liquor laws are a World War I inheritance that have lingered around for too long. Legislators are gradually cutting some …and customers, however, visitors may still see signs inviting people to consume a meal with their drinks. As a result, visitors may notice signs inviting people to consume a meal with their drinks. Do read all signs and abide by local drinking laws to avoid problems. Apart from this, the overall night life in Vancouver is sophisticated, hip and it befits the sleek urban setting. On average Vancouver night clubs are open until 1–2am. Many entertainment venues, bars and pubs are centred around Granville and Gastown, they are also conveniently located within reach of public transportation making it easy to enjoy your evening about town. At 932 Granville Street, The Roxy is a casual rock-and-roll club for some unpretentious fun with live music.People of all ages enjoy the 80s and 90s retro music and the lively atmosphere. It can get very crowded on Saturday evenings. Located in the heart of Vancouver’s Chinatown, Fortune Sound Club (147 Pender St) is a revamped club that animates the Vancouver night life scene with dance floor lights, a thick haze and a contemporary music. Guilt & Company (1 Alexander St) operates on a first-come-first-served basis and provides food and plenty of live music. Take a stroll on the wild side and enjoy the Burlesque cabaret acts. Music includes folk, jazz and blues. The menu is extremely limited but you won’t go hungry. Revel Room (238 Abbott St) is the place where old country, folk and blues happen from Sunday to Thursday (except Mon). They are open until 1am on Fridays for cocktails and dinner. The Alibi Room is a short distance from Gastown. This gastro pub is a favourite destination of craft beer fans. A range of local and imported ales is available to wash down the tasty pub fare. Open to 12:30am on Friday and Saturdays for walk-ins. The Bacchus Piano Lounge (845 Hornby St) is exactly what the name says – a lounge. The atmosphere is relaxed and the live piano music is the right accompaniment to casual or more intellectual conversation. If you expect attentive service in a classier atmosphere this is what you are in for. The lounge is open until midnight on Thursdays and Saturdays. Located near Gastown and Yaletown is the Electric Owl Club (926 Main St) a crowded venue with seating for large groups. Frequented by all types of people, the club features Indie music and non-stop dancing. Biltmore (2755 Prince Edward St) is a small dimly-lit venue with a jam-packed events calendar. From live bands and cabaret shows to events, up-and-coming entertainers and retro-nostalgia nights with 50s, 60s, rock and roll and psych music. Opens at 8pm until 1am on Sat. Shows begin at 9pm. Steamworks Brewing Company (375 Water Street) is a place where you can chill out at the bar with a Canadian beer and enjoy a view of the harbour. Often crowded with locals and visitors, don’t expect to find a quiet spot. Red Card Sports Bar is two streets down from Granville. This is a casual yet stylish sports bar with TV screens showing live sports on a daily basis. Hip-Hop and progressive house music liven things. There are two bars where sports fans can wet their whistle. A fixture of the Vancouver night club scene, Celebrities (1022 Davie St) has been a Vancouver fixture for almost 30 years and has featured guests like Boy George and David Guetta. The recently renovated venue is located in Vancouver’s gay community. From pop to R&B and House music, it features a range of music genres for a mixed crowd. The Commodore Ballroom is a concert venue with a history. Since opening in 1929 the venue has seen a long list of entertainers, from big band orchestras to Count Basie, Cab Calloway and Sammy Davis Jr. Today the Ballroom features an eclectic mix of live entertainment, from Katy Perry and Lady Gaga to Snoop Dogg and Roger Daltrey. The Orpheum Theatre (601 Smithe St) is home to the home-bred Vancouver Symphony Orchestra. Founded in 1919 the third largest symphony orchestra in Canada performs hundreds of concerts each year featuring compositions from the most important classical music periods. Visit the Vancouver Symphony Orchestra for season concert tickets. . Ten Tapas (1010 Beach Ave) is a Latin music venue featuring beautiful Latin music including Spanish Flamenco-inspired jazz, Caribbean music, Brazilian Samba-inspired music, modern/cool jazz, and other sophisticated jazz sounds. Everything sounds even better when you enjoy it alfresco on the delightful terrace on the water. If you are lucky enough to visit Vancouver in the summer you can attend the Vancouver International Jazz Festival. Since its inception in the 1980s the event has gone through several denominations but the genre has rigorously been jazz. Early festivals saw names like Miles Davis and Tito Puente. Tickets are purchased at the Vogue Theatre at 918 Granville Street, The Orpheum Theatre, The Vogue Theatre and Roundhouse Performance Centre. The June/July event also features a number of free concerts website. A comprehensive guide for all-things Jazz and listings of jazz music venues in Vancouver is http://vancouverjazz.com/. For the first time in the history of British Columbia, the province hosted the 2010 Winter Olympics and Paralympics. The honour went to the city of Vancouver.Almost 3,000 athletes from 82 nations participated in 100 sporting events which were held in suburban areas of Vancouver. Events also took place in the town of Whistler. Before Vancouver, Canada hosted the 1988 Winter Olympics in Calgary, Alberta, and the 1976 Summer Olympics in Montreal, Quebec. A well known name in the Canadian sports scene, the Vancouver Canucks are part of the National Hockey League and have been playing Canada’s favourite sport since 1970. The team plays 42 regular season home games. The Canucks also play exhibition and play-off games. They made it to the Stanley cup finals three times but lost. From 1974 to 1993 The Canucks won three division titles as members of the Smythe Division. They won seven titles as members of the Northwest Division from 1998 to 2013. The season runs from October to April. The Canucks play their home games at Rogers Arena (800 Griffiths Way). The season runs from October to April. A junior hockey team, the Vancouver Giants have been around for 13 seasons. In 2006 they won a President’s cup and a Memorial Cup in 2007. They play at the Pacific Coliseum. There are a number of hotels close to Rogers Arena. Hampton Inn & Suites (111 Robson St), Sandman Hotel Vancouver City Centre (180 West Georgia Streeet), L’Hermitage Hotel (788 Richards Street). Popular restaurants and bars in the neighbourhood are Triple O’s, Carve Subs, Cin City Donuts and Steamer’s. Beatty St Bar & Grill. Vancouver’s minor league baseball team was created in 2000. The Vancouver Canadians are affiliated with the Major League Baseball team, the Toronto Blue Jays. They play 38 home games from June to September. Scotiabank Field at the Nat Bailey Stadium (4601 Ontario St), also known as “The Nat” is where they play their games. Some popular hotels near The Nat include Best Western Plus Uptown Hotel (205 Kingsway), Holiday Inn Vancouver (711 West Broadway at Heather St), Park Inn & Suites by Radisson (898 West Broadway). Restaurants and bars close to the Stadium include Cottage Bistro (4470 Main St), Chaise Lounge (4444 Main St), Parmz Pizza Factory (4438 Main St). The BC Lions are Vancouver’s professional football team. The team is part of the Canadian Football League and it has enjoyed greater success than its predecessors, the Vancouver Grizzlies, a defunct football team. Since their first season game in 1954 the Lions have taken home the Grey Cup six times. Their most recent championship occurred in 2011. They currently play at their home field, BC Place (777 Pacific Blvd). 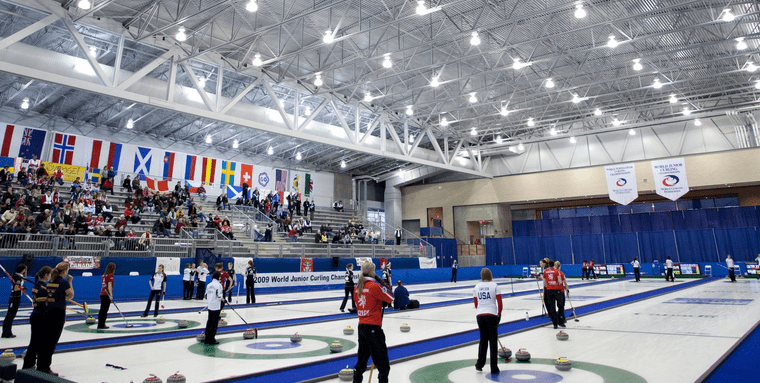 The sports venue hosted the 2010 Winter Olympics and Paralympics and it is also home to the BC Sports Hall of Fame. Hotels near BC Place: Georgian Court Hotel (773 Beatty St), YWCA Hotel Vancouver, Rosedale on Robson. Restaurants and Bars near BC Place: Vue Bar & Lounge, Splash Bistro, Captains Room (800 Grittiths Way). Vancouver’s soccer history began in 1979 when the Vancouver Whitecaps, the city’s professional soccer team, won the NASL Soccer Bowl Championship. The soccer season runs from March to September. Vancouver Whitecaps’ home field is BC Place (777 Pacific Boulevard). The Vancouver Canucks got their name from a Canadian logger, Johnny Canuck, who was not a professional hockey player but only played in his spare time. Hockey was invented in the 1850s by British Soldiers in Canada. The game did not have any rules until a group of students from Montreal’s McGill University created them in 1879. Sports are very important for Canada’s economy. In 2007 sport tourism created 28,000 full time jobs in Canada and raised about $100 million in taxes. There is always a lively buzz around Granville Island Public Market (1689 Johnston St). 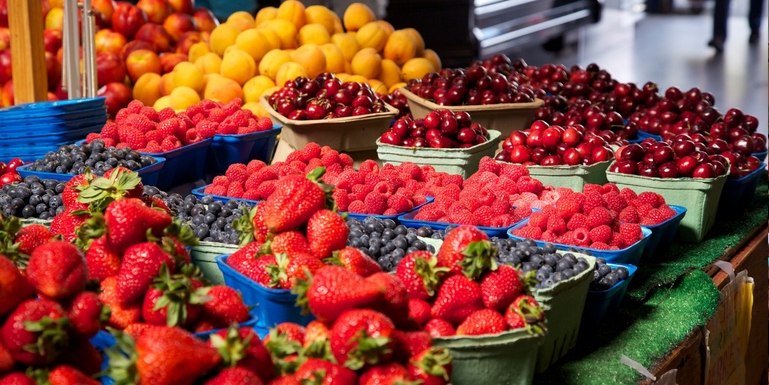 Packed with all sorts of goodies, the market sells produce and hot food, specialty food items and gifts for foodies, tea, coffee, beer, jams and Canadian maple syrup. Non-foodies can shop for crafts, art work, photography, jewellery, hand-made soaps and children’s items, jams and Canadian Maple Syrup. You could easily spend the entire day browsing the stalls. The market is open 7 days a week from 9am to 7pm. The tree-lined streets in the Dunbar-Southlands area lead to the city’s commercial district where dozens of stores are scattered throughout Dunbar Village. You can find second hand items, home decor, books, groceries, beauty salons and convenience stores. In the heart of Gastown the Inuit Gallery of Vancouver (206 Cambie St) has Native art paintings, sculptures and objects for large budgets. Depending on how serious an art collector you are you can find a number of limited edition prints and drawings that can be purchased at reasonable prices. You can find delectable hand crafted chocolates at Chocolate Arts (1620 W 3d Ave) made in small batches, the artisan way, with natural and local organic ingredients. These products have no additives, colourings or preservatives. Dream Apparel (356 Water St) is where you can find affordable designs and fashions by local Vancouver designers. If you are looking for a more unique look local fashion designer Zonda Nellis (Design Ltd at 2203 Granville St) creates rich, opulent fashions with Italian and French fabrics, vibrant colours and precious textures. A few blocks down the road from Gastown is the posh fashion store Leone (757 West Hastings St). Everything about it spells elegance and class. This is luxury shopping for serious customers. There are VIP private shopping appointments and valet parking for the lucky few who enter these doors. The retailer caters to a cosmopolitan clientele and the film industry. Among the ready to wear and couturier fashions are names like Saint Laurent, Ungaro, Valentino, Armani, Missoni, Moschino, Prada, Roberto Cavalli, Versace, Dior and Miu Miu. La Casa del Hebano (402 Hornby St) is a well known licensed tobacconist that sells pipes, humidors, Brighamm pipes, lighters, cutters, cases, smoking accessories and assorted of Cuban cigars. As with other major Canadian cities Vancouver has its share of domestic retail chains. Chapters (788 Robson St) is a bookstore along the same lines as Barnes & Noble, but don’t even think about mistaking it for an American store. The chain prides itself in its Canadian origins and goes to great lengths to put it in writing on just about everything it advertises. Another “proudly Canadian” retailer is Roots Canada (1001 Robson St) with its casual clothing with an outdoorsy feel and the unmistakable Roots logo embossed on the apparel. Originally from British Columbia Lululemon is the brand name of a hip line of work-out and yoga clothes for women and men. The distinctive body hugging clothes are worn by just about anyone who wants to be seen in them. The oldest retail chain in Canada, the Hudson’s Bay Company (674 Granville St), has its origins deeply rooted in the country’s colonial past of fur trading. Today the company has department stores in every major Canadian city and sells medium to medium-high priced apparel, handbags, footwear, cosmetics and home accessories. Holt Renfew (737 Dunsmuir St) is an upscale department store with designer fashions, accessories, beauty items, jewellery and men’s clothing. 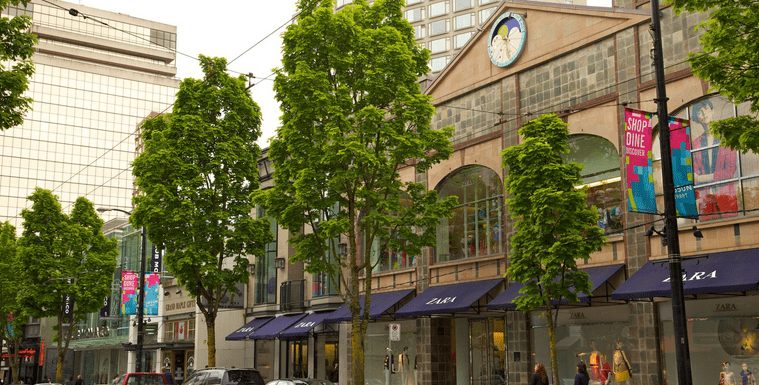 The department store is located 5 minutes from Gastown, next to the Orpheum Theatre. You can access Holt Renfrew via the Pacific Centre shopping mall at 701 West Georgia St. The mall houses dozens of upscale retailers like Ermenegildo Zegna, Geox, Michael Kors and Guess. Oakridge Centre (650 West 41st Ave) is Vancouver’s other upscale shopping mall with hundreds of retailers and services. Luxury retailers include Rolex and Tiffany & Co.
Metropolis (4700 Kingsway has over 400 shops and services and is located in the Greater Vancouver district of Burnaby. Retail names include Armani Exchange, Best Buy, Chapters book store, Target and a number of banks. An increasing number of Vancouver restaurant owners are embracing the moderate-portion practice that puts the emphasis on quality rather than quantity. The use of fresh, locally sourced ingredients is common practice. The expanding culinary scene beckons emerging chefs who compete with veteran chefs to delight your taste buds with award-winning dining experiences. Eating in Vancouver is not cheap, however. If you add ambiance and spectacular views to the menu your dinner bill will soar before you order anything at all. Location comes at a price. Fortunately, there are less ostentatious diners, cafés and bistros of more modest means without compromising on quality. Good food at affordable prices is available in cafés, diners, food trucks and pubs. Several ethnic food eateries produce fresh, simple dishes at mid-range prices. Some of the food trucks’ culinary endeavours are surprisingly delicious and affordable lunch time meals for tourists and scores of regular lunch time customers from surrounding offices. The Roaming Dragon (Burrard St & Robson St) is a food truck that cooks up a mix of Asian food like Thai, Vietnamese, Malaysian and Chinese fare with an unusual, but increasingly common, mix of Asian and Mexican (Asian tacos), at reasonable prices. The Kingston Taphouse & Grille (755 Richards St) Pub is a mid, mid-high range pub with a menu that is more ambitious than the average pub menu. $8 will get you a plate of fish and chips, for $10 you can eat traditional bangers and mash. Double that amount if you fancy the tuna risotto or the strip loin. Drinks are not cheap. Nuba Café (146 3rd Ave E) is a Lebanese restaurant with a Middle Eastern menu and an informal atmosphere. This is often defined a vegetarian restaurant but the menu does include meat dishes, however, vegetarians and vegans can happily find plenty of fresh, green choices. The carefully sourced ingredients make this a healthy choice. If you’re on a budget you and a buddy can share a plate for $15. Owned by the Roman born owner and pizza maestro, Trilussa (4363 Main St) is where pizza gives “foot-long” a whole new meaning. The owner capitalizes on the Roman tradition of selling pizza by the foot. The additive-free pizzas and breads are baked daily. These recipes are authentically Roman. The café-style eatery has very limited seating because was conceived mostly as a take out place. The Templeton (1087 Granville) might just be one of those places where the quality of the food exceeds the service. This reasonably priced diner features organic ingredients and serves breakfast, lunch and dinner in the retro atmosphere of an old fashioned diner. Breakfast includes veggie bacon. Forage (1300 Robson St) uses fresh, meticulously-selected local ingredients. The restaurant owners live by the rule that we should “take only what we need to survive,” therefore don’t expect all-you-can-eat portions. This restaurant focuses on quality rather than quantity and the portions are average – enough to savour the food without being overwhelmed by it. The restaurant does get crowded, therefore reservations are recommended. Yaletown Italian restaurant La Terrazza (1088 Cambie St) has accrued accolades and rave reviews thanks to its integration of Italian cuisine and local west coast ingredients. Save some room for the delectable dolci (dessert). Tableau Bar Bistro (1181 Melville St) combines French cuisine with west coast ingredients. If you stop for a drink and can’t stay for dinner, you can order take-out bistro fare for lunch and dinner. Bishop’s (2183 West 4th Ave) has a limited menu with various meats and fish. Customers who wish to repeat the experience at home can purchase Bishop’s cook books featuring the restaurant’s dishes. At Chambar the menu features local seafood along with French and Belgian cuisine created by the owner who is a Belgian chef-turned restaurateur. Housed within Vancouver’s Opus Hotel (350 Davie St) is the Italian restaurant La Pentola. The northern Italian cuisine is rustic and hearty. The panini are delectable. The sleek ambiance and waterfront location of Miku (200 Granville St) make this a trendy location to dine out in Vancouver. This pricey Japanese restaurant features traditional dishes such as seaweed salad and sushi rolls. Sandbar (1535 Johnston St- Creekhouse #102) is set against the ostensibly industrial setting on the waterfront. The in-crowds enjoy their meal in a unique location under massive bridge steel beams. Mostly a seafood restaurant, the menu also features a range of flatbreads, truffle parmesan fries and pan roasted steak with mushrooms. The signature element of Blue Water Café (1095 Hamilton St) Japanese restaurant is the raw food. The menu includes pricey items such as caviar and oysters, as well as octopus and eel. Campagnolo (1020 Main St) serves traditional Italian trattoria food. Rustic dishes like gnocchi, cannelloni, rigatoni and melt-in-your-mouth buffalo mozzarella dishes, are part of regional cuisines from southern, central and northern Italy. 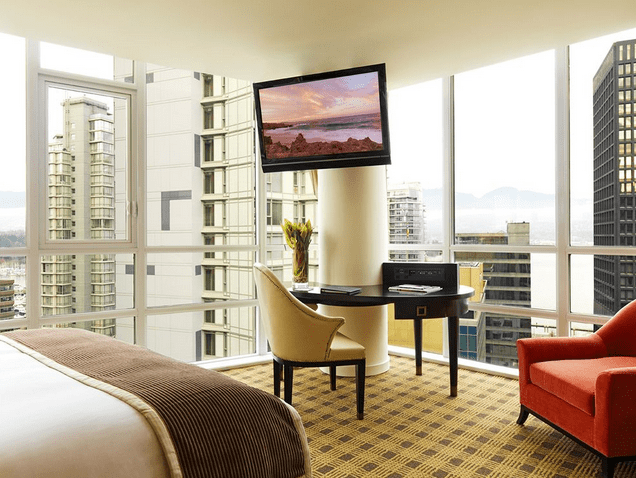 Many hotels are clustered in and around Vancouver’s West End among the city’s imposing steel and glass buildings. Vancouver is a city with high standards, it rarely disappoints, however be prepared to pay premium rates, even for more modest hotels. Hotel rates fluctuate considerably during the high-low seasons, making some luxury hotels affordable during the low season. A 15% tax and 1.50% service charge are levied in addition to all hotel rates*. A high number of Vancouver hotels are pet friendly. Most will allow children to stay, free of charge, in existing rooms. 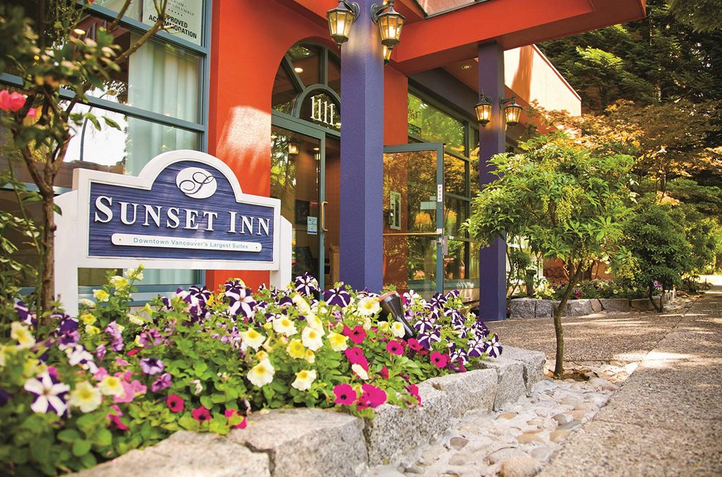 Located in the West End, Sunset-Inn-And-Suites (1111 Burnaby St) is within a short distance from Robson Street and Sunset Beach. The suites are large and come with kitchenettes and balconies with views of the mountain or the water. There is free on-site parking and free Wi-Fi. You can walk to Stanley Park, English Bay and the Granville island Ferry. Low season rates start at CAD$209.00, high season rates start at CAD$239.00. Comfort-Inn-Downtown-Vancouver (654 Nelson St) is located in the city’s entertainment district. It is a 10-minute walk from the Art Gallery and Granville SkyTrain. Gastown is 5 minutes away. With a hotel rate of CAD$79.00- $120.00 this hotel is a real bargain during the winter months. During peak season, however, rates soar with an average of CAD$300.00 – $330.00. Hotel guests are required to walk over to the pub next door for breakfast, and while this might seem like a deterrent, the low off-season rates may well be worth the 1 minute walk. 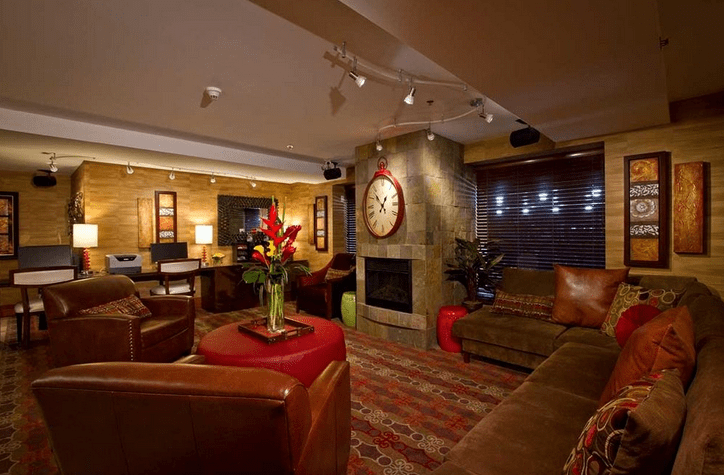 Right in the heart of the entertainment district is the Ramada-Vancouver-Downtown hotel (1221 Granville St), a few minutes from Yaletown, Granville Bridge, and 1km from Sunset beach. The rather imposing on-site Irish Pub sets the atmosphere for this hotel. The dark interior décor and medium-small rooms may not be a plus, however it does have a number of features that compensate for this. The central location, free Wi-Fi in all rooms, free gym tickets and coffee makers in the rooms are just a few. Low season rates start at CAD$115.00, high season rates are CAD$228.00. Times Square Suites apartment hotel (1821 Robson St) is a great place for extended stays and for families. A number of amenities give this hotel an apartment feel: suites with separate living and sleeping areas, kitchenettes with dishwasher, gas fireplace and laundry facilities, among other things. The streets in the area are lined with shops, restaurants, cafés and bars. A grocery store is conveniently located across the street. The hotel staff will graciously offer their fax service on request. They will also print documents and boarding passes. Rates start at CAD$143.00 for the low season and CAD$179.00 for the high season. Vancouver’s West End is the pulsating residential neighbourhood with high-rise apartments and tree-lined streets with hundreds of restaurants, shops and cafés, where the majority of the city’s best rated hotels are located. The West End Marriott-Pinnacle-Downtown Hotel (1128 West Hastings St) is 10-15 minutes from downtown. The hotel staff is helpful and always ready to offer prompt, courteous service and assistance. If you have Fido with you make sure you tell the hotel staff when you book, there may be an extra charge for your pet. The convenient concierge desk in the hotel is a godsend for people who need help with tourist information. Low season rates start at CAD$175.00, high season rates start at CAD$400.00. 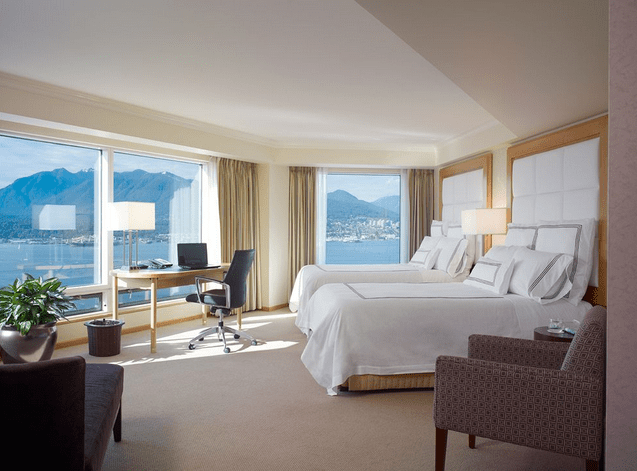 Fairmont-Waterfront (900 Canada Place Way) is a 5-star hotel with service to match. The hotel staff exemplifies dedicated, courteous service. The superb location on the water comes with a price tag. Parking is pricey and there is an extra charge for Wi-Fi. Low season rates start at CAD$259.00, high season rates start at CAD$400.00. Rosewood-Hotel-Georgia (801 West Georgia) close to Robson Street, in the bustling West End, has an indoor saltwater pool and a scenic roof top restaurant for alfresco dining to cap off your day. There is free Wi-Fi throughout the hotel and pets are welcomed on request. If you are driving make sure you ask about the parking rates when you book to avoid costly surprises. Low season rates start at CAD$320.00, high season CAD$425.00. The Coastal Coal Harbour Hotel (1180 West Hastings St) is close to Robson Street and within walking distance of Stanley Park. The floor-to-ceiling windows in the rooms provide superb views of the North Shore mountains. It is always good to know that the hotel has 24-7 room service for your hotel needs. If weather permits you can relax in the hot tub on the rooftop deck and enjoy the city vistas. Low season rates start at CAD$180.00, high season starts at CAD$ 287.00. 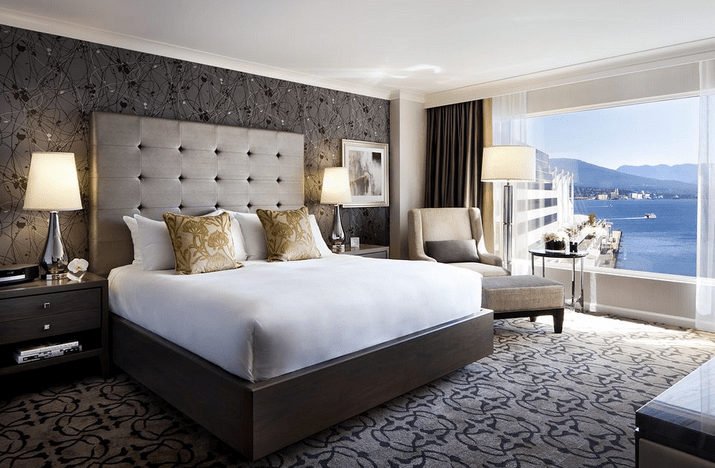 Situated on the scenic landscape of the Burrard Inlet waterfront, Canada Place is home to the sumptuous Pan Pacific Hotel. Pan-Pacific Hotel. The imposing hotel makes a statement of posh grandeur. The ambitious architectural project strategically capitalizes on the breathtaking views from just about anywhere in the hotel. You will not want to miss the natural scenery from the outdoor pool deck. The pet friendly hotel is always happy to provide mats, food and water bowls for your canine friends. Low season rates start at CAD$174.00, high season starts at CAD$574.00. Located near the Art Gallery and a short distance from the Sky Train station, Hermitage-Hotel (788 Richards St) is an elegant, tastefully-decorated hotel. The marble bathrooms and soft bathrobes are details that add a touch of affordable luxury. The hotel features an on-site library, a 24 hour gym, a tourist information area and an indoor saltwater pool. The overall atmosphere and ambiance is a charming je-ne-sais-quoi. If you happen to stay here during Vancouver’s rainy season you run no risk of getting caught in the rain because the hotel is happy to provide hotel guests with umbrellas. Low rates start at CAD$175.00, high season rates start at CAD$300.00. Loaded with character and charm the Wedgewood-Hotel-Spa (845 Hornby St) is a hotel with Old World ambiance. There are rooms with private balconies overlooking the city. The decadent hotel spa is a heavenly retreat with expert hands waiting to rub away the daily stress. Other small luxuries include the free bathrobe, slippers and toiletries. If you can tear yourself away from this jewel you can step outside and go for a stroll down Robson Street, one of the most expensive streets in the world. Low season rates start at CAD$198.00, high season rates start at CAD$368.00. Loden-Hotel (1177 Melville St) is a jazzy boutique hotel with character. The interior décor is an appealing mélange of colours that stand out against more reassuring neutral tones. A fresh change from the ubiquitous browns typical of hotel chains. Elegant touches like lustrous black-veined marble sheathe the bathrooms. The free car and bicycle service (downtown use only) provided by the hotel is a real bonus. The multinational staff speak 8 languages including Bulgarian and Japanese.. . Low season rates start at CAD$229.00, high season rates start at CAD$359.00. The façade of the Sylvia Hotel (1154 Gilford St) is almost entirely covered by the leafy foliage of the Virginia creeper. This cozy 120-room boutique hotel is tucked away in a quite Vancouver neighbourhood. The 100-year old hotel is steps away from the water on English Bay and conveniently located across Stanley Park. A designated heritage site the building was owned by Mr. Goldstein in 1912 who named it after his daughter Sylvia. The pet friendly hotel has a warm, familiar atmosphere, affordable on site parking and a lounge with live entertainment. The heart-warming story surrounding a stray cat that decided to make Sylvia hotel its permanent home a while back has resulted in two popular children’s books that guests can purchase in the hotel lobby. Low season rates start at CAD$115.00, high season rates start at CAD$199.00. The Burrard Hotel is situated on the eponymous street at 1100 Burrard. The former Burrard Motor Inn in the 1950s underwent extensive renovation over the years. The California-motel architectural style with a central court, is a mix of retro nostalgia and contemporary hip style. Located 3 blocks from the shopping district this is a busy area. You are better off booking a room at the back of the hotel to avoid traffic noise. If you can live without A/C this is a bargain hotel in a great location. Rate include free bikes, gym passes and free Wi-Fi. Low season rates start at CAD$94.00, high season rates start at CAD$169.00. Close to the Gastown district is the site of the 1898 historic Victorian Hotel (514 Homer St). The hotel architecture and interior walks on the traditional side and retains many original Victorian features like the high ceilings, hardwood floors and stately crown mouldings. Each room is outfitted with beautiful period furniture. Some rooms come with shared bathrooms. Room rates during the low season start at a mere CAD$ 80.00, high season rates start at CAD$189.00. You can use Expedia.ca to browse a full list of hotels in Vancouver, along with reviews & ratings. You can tour the area by land, sea or soar toward the sky to get aerial vistas of the cityscape, if only for a few minutes. Visit the city on a hop-on-off tour, cross-water, cruise or coach tour. Historic tours delve into Vancouver’s forbidden past when the town was dominated by a contradictory mix of whiskey, gin and prohibition. Harbour cruises depart from Vancouver Jack Poole Plaza (Vancouver Harbour Flight Centre). Fully guided tours take you along the inner Burrard Inlet, the English Bay, past the city skyline, the docks and the North Shore. On the other side of the peninsula you can cruise the beautiful English Bay, False Creek and Granville Island. 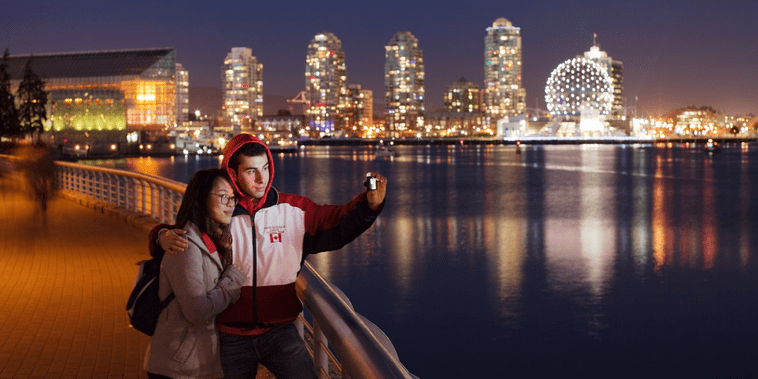 Depending on the mood you’re in you can cruise at sunset and have dinner while you tour the Vancouver Harbour. Harbour tours start at CAD$29.95 for adults. Grouse Mountain and Capilano Suspension Bridge tours are all-day (about 7 hours) affairs and include a tour of the fascinating life cycle of the salmon hatchery, the Grouse Mountain Skyride, panoramic views of the Burrard Inlet, Cliffwalk and Treetops Adventure at Capilano Suspension Bridge. 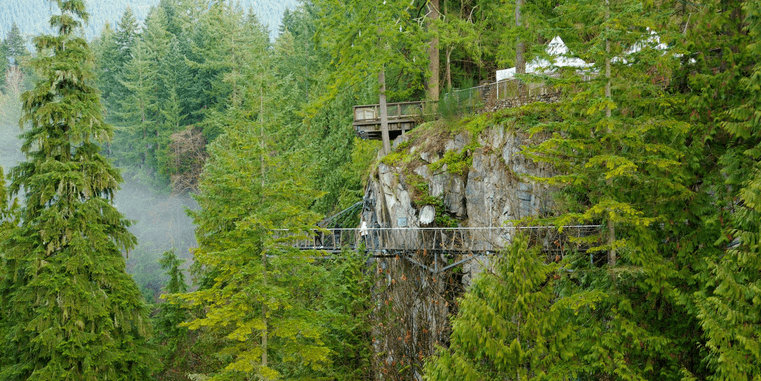 If you can handle being suspended 230 feet in the air and if Grouse Mountain weather permits, you can also cross the Capilano suspension bridge. Tour prices start at CAD$149.00 per adult. Depending on the tour operator you choose, tours start daily at 10am or 10:30am. If you would rather soar hundreds of feet above the city you can take a helicopter or seaplane tour. Prices start at CAD$109.00 per passenger for 8-minute tours and CAD$399.00 for private tours. Visit the tour websites for information about tickets, group tours and schedules. Vancouver’s bus operator Pacific Coach provides Express Motorcoach service between Vancouver hotels and Whistler. The bus also services Vancouver International Airport and downtown Victoria. The company’s cross-water ferry service operates between Vancouver and Victoria. Coach Service for Whistler begins at 6am and departs from Melville, Vancouver. The Whistler Express Day Trip departs at 1:40 am daily and costs CAD$98.00 per adult. Cross-water ferry service between Vancouver and Victoria costs CAD$40.00 per adult. Visit the Pacific Coach website for information about schedules, fares and tours. Vancouver is a modern city with a hauntingly present heritage. Its past has not been obscured by modernity. The ubiquitous presence of First Nations Totem Poles are the preserved tradition of a culture whose symbolism and mythology are very much alive. Vancouver has one of the most significant collections of Totem Poles in North America. They are the cradle of civilization that bears witness to groups of peoples who inhabited the land before the arrival of European explorers. Their vertical lines contrast the skyline of concrete and steel. 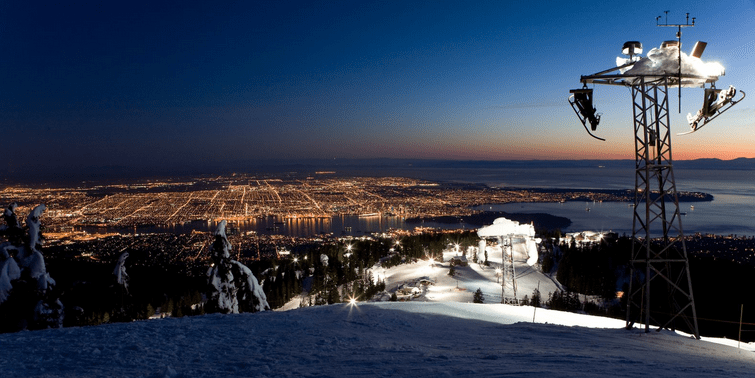 Cypress Mountain is where you can visit the 2010 Olympic snowboard and ski runs. From the mountain the views of the city are unparalleled. If scenic tours are your thing don’t even think about visiting Mount Seymour without your camera. The view at the top is worth the challenging hike along the rugged trail up the mountain. Don’t forget to bring your hiking shoes if you are looking for some serious exercise. There is no shortage of trails in Vancouver and Grouse Mountain has a 2.9 kilometre (1.8 mile) trail you can explore when weather permits. If you are looking for a more challenging endeavor head over to Vancouver’s north shore and cross the Capilano River on a steel bridge suspended 230 feet in the air. The 460-ft crossing of the Capilano Suspension Bridge is a total immersion in British Columbia’s rainforest ecosystem, not to mention the view of North America’s largest (private) collection of First Nations totem poles. Vancouver’s numerous beaches draw warm-weather visitors to their inviting shores. English Bay beach is always bustling with life and activity. Walk along the beach, watch the sun go down while relaxing on one of numerous benches or enjoy an espresso at one of the cafés. English bay is located in proximity of Davie Street and Denman Street. A short distance away is the aptly named Sunset Beach where every evening the sun goes down for romantic onlookers. On weekends the beach is always an event-filled destination. At South West Marine Drive and University Boulevard, you will find a steep, descending cliff that guards the privacy of Vancouver’s famed nudist beach. Wreck Beach is a 7-kilometre stretch of pristine, mostly rocky beach. Visitors who are planning to visit the area should read and abide by the beach etiquette and rules. Should you forget to do so, you will receive guidance from one of the volunteer beach monitors at the beach. Located in Stanley Park is the large Vancouver-Aquarium (845 Avison Way). Walk from Stanley Park aquarium (845 Avison) along the Vancouver Waterfront and take in the changing views. Proceed to the cruise ship terminal area and land at Canada Place. The Canada Place complex is situated along Vancouver’s Burrard Inlet, that separates the City of Vancouver and the rest of the Burrard Peninsula from the North Shore Mountains. Canada Place is home to the Vancouver Convention Centre and the imposing Pan Pacific Vancouver Hotel. Take a stroll along the promenade surrounding Canada Place to catch views of the city districts like Gastown, the North Shore peaks and Stanley Park. If this is your first visit to Canada you can take a virtual tour with the Flyover Canada tour, a simulated flight across the country, offered by Canada Place. 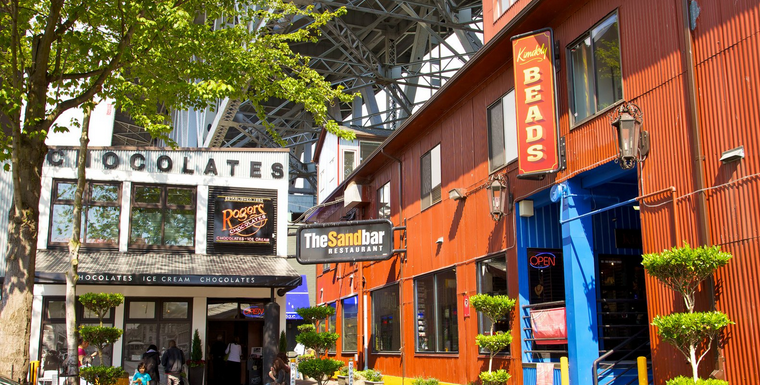 After exploring Vancouver’s natural beauties you can browse the cafés, shops, distilleries, bars and restaurants at Granville Island. The presence of artists and art galleries in this area compensates for the fact that it can sometimes appear very touristy. Access is possible via harbour ferry from the West End, or by crossing the bridge at Anderson Street. Between Powell and Prior Streets, parking is surprisingly easy if you want to visit Vancouver’s Chinatown. You can savour the colours, flavours and aromas of the Chinese culture through the neighbourhood’s tea and herbal shops, gift, jewellery shops, museums, bars and restaurants. Head over to West Hastings Street and take the 170-metre elevator ride to the top of the Vancouver Lookout for 360-degree views of the city. If you plan to stay several days you may want to start your tour of the city with an aerial view to give you an idea of the city layout. Vancouver’s museums are not just for the erudite, they are places of curiosity and learning where you can find the old and the contemporary. From motorcycles to totem poles, jewellery, skeletons and sports artifacts, there are dozens of museums in the city for every taste. Vancouver Art Gallery (750 Hornby St) has historical and contemporary exhibits spread out over 4 floors. While this is mostly a Canadian art museum, the works from the Group of Seven, Canada’s most important group of painters from 1920 to 1933, are always appreciated for their style and technique. These artists immortalized the Canadian landscape on canvas and became an integral part of Canadian history. Adult rates are CAD$20. For a complete list of art galleries in Vancouver visit the Vancouver art galleries website. Founded in 1947, the Museum of Anthropology (6393 North West Marine Dr) located on the grounds of the University of British Columbia, is a massive concrete and glass building containing predominantly works by First Nations groups. The archeological artifacts and ethnographic objects are over half a million. The museum also houses a collection of European ceramics from the 16th to the 19th centuries. Hours or operation are daily from 10am to 5pm, Tuesday from 10am to 9pm. It is closed on Mondays during the winter months. Adult admission is CAD$16.75. The Beaty Biodiversity Museum (2212 Main Mall) exhibits hundreds of collections that aim to educate and share the importance of biodiversity. Visitors are greeted by a large skeleton of a blue whale at the main entrance. Hundreds of specimens take visitors through a scientific journey about the natural history and biodiversity of our planet. Adult admission is CAD$12.00. Not your average museum, the Vancouver Police Museum (240 Cordova St) is housed in a former morgue. Clearly not for the faint of heart, this museum can be fascinatingly mysterious because it provides insight into the less glamorous side the city’s law enforcement. The crime history, forensic investigation reports, artifacts and tools of the Vancouver police are on display. Yearly events and festivals in Vancouver animate the city and celebrate the arts, sports, cuisine, heritage, the old and the new. In its 16th year, the International Vancouver Jazz Festival has seen its share of Jazz virtuosos, from Wynton Marsalis to Tito Puente and Miles Davis, the summer festival has become the largest of its kind in British Columbia. A favourite film location, Vancouver has been hosting the annual Vancouver International Film Festival since 1982. Showcasing Canadian and international films, it is among one of the most important film festivals in the world. The Vancity Theatre, a 175-seat theatre is home to the film festival, seminars and film presentations. Each year authors, poets, novelists and artists attend the annual Vancouver Writers Fest, a 6-day celebration of the written and spoken word on Granville Island. 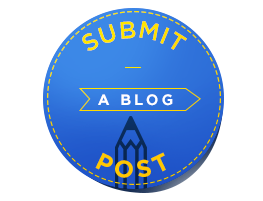 The event, which aims to promote literacy and just plain, good old fashioned reading, is open to writers, children, adults, teachers, volunteers and people of all backgrounds. Each summer the sky lights up at English Bay as the July Honda Celebration of Light kicks off the festival of lights in Vancouver. The annual fireworks competition is a multiple day event that brings competitors from all over the world with their pyrotechnical magic. During the warmer months crowds of locals and tourists flock to Kisilano Beach (facing the Burrard Inlet). It might have something to do with the longest swimming pool in Canada, the saltwater pool, the numerous beach volley courts, children’s playgrounds, skating paths, jogging and cycling paths. Quiet and romantic it is not, but if you’re looking for action this is it! Vancouver’s Jericho Beach Park is the outdoor venue for the annual Vancouver Folk Music Festival that sees thousands of music lovers attend the event. The 3-day festival has been attracting musicians and performers from all over the world since its inception in 1978. For a complete list of Vancouver events, annual festivals and happenings visit the British Columbia, Vancouver Tourism website. 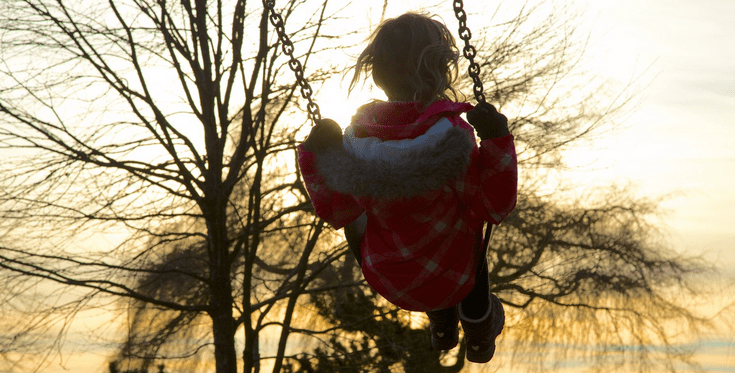 Visit the Vancouver Parks and Recreation website for a complete list of parks and gardens in and around the city. A single day in Vancouver should be spent exploring the city’s core. The approximate budget per person, for one day, including, basic ticket prices, admittance, public transportation, food at any of the mid range eateries is about CAD$300.00 per person. This is very approximate and does not include souvenir shopping, applicable taxes or gratuities, or any of the tour variants, upgrades, etc. You should plan to budget twice this amount if you intend to go on longer guided tours, lunch and/or dine at high-end restaurants, take taxis or other more expensive modes of transportation. Cruises generally start at 10am – 11am at Burrard Landing. if you choose the short, one-hour harbour cruise (the most economical) you will be taken on a scenic tour through the Burrard Inlet, past Stanley Park, the ship terminals, the Vancouver skyline, Gastown and the North Shore Mountains. Don’t forget your camera! More intimate and considerably longer harbour tours are available for prices that increase considerably. Once you get off the cruise boat explore the area’s ship and sea plane terminal (watch small planes land and take off), and take in the superb views of Vancouver’s urban landscape and mountainous backdrop. Embark on the FlyOver Canada tour to learn about this vast North American country. After touring Vancouver’s waterfront explore the city’s West End main core – Robson Street. If you are ready for lunch this is where you can find affordable restaurants. After lunch you can peruse the trendy shops. The area comes alive at night so you can always go back when the sun goes down for drinks or dinner. You will soon discover that people watching is a favourite local and tourist pastime in this area of the city. Vancouver is a city that deserves to be seen from above to appreciate the unique geological layout. Fortunately visitors have a number of more or less affordable options to do this. The least expensive option is the Lookout Tower at 555 West Hastings Street, about 10 minutes from Robson Street. The admission price is CAD$16.00. The tower is open daily until 9pm – 10:30pm, so you can always go back at night before you leave Vancouver to catch night vistas of the city. Hop on a ferry at the West End and head over to Granville Island. A lovely place to while away the day, Granville Island market is filled with food stalls, crafts, gifts and so much more. Grab some lunch or a snack and enjoy it along the waterfront. Browse the art studios and galleries, or watch blown glass artisans do their magic with glass and fire. The history of the area’s Native peoples is a voyage back in time. It is a cultural experience for anyone wishing to dig deeper into Vancouver’s past and the First Nations tribes that inhabited the area. Depending on which day you visit make sure you have enough time to visit the collections as the museum closes at 5pm on most days and 9pm once a week. Vancouver Museum of Anthropology is located at 6393 NW Marine Drive, about 18 minutes from Granville Island. Stanley Park is a rain forest eco-region within the city. Over 1000 acres of park almost entirely surrounded by water, half a million trees, numerous types of flora and indigenous fauna make up an important ecosystem at the foot of the city. Surrounded by a stone wall enclosing the perimeter of the park (Seawall), this is a heavenly getaway from the urban jungle for those in pursuit of more tranquil activities like going for a stroll, biking or skating. 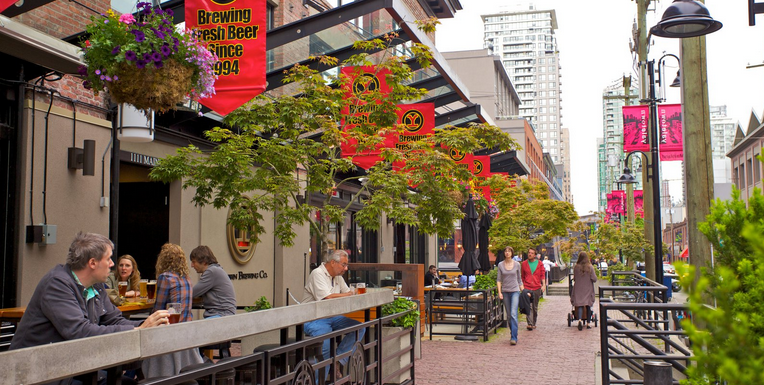 Once regarded as the old warehouse district, Yaletown is the hottest spot to be these days. If the name ‘Yaletown’ conjures images of frothy beer, there’s a reason for that. The neighbourhood is considered Vancouver’s home of handcrafted cocktails. Feel free to taste your way around the avenues—and see the historic buildings while you’re at it—when you go on a walking tour. Most of the popular restaurants along the way, such as Yaletown Brewing Company, offer roomy outdoor patios, making this a good spot to explore at sunset. Aside from the suds, Yaletown is dotted with a ton of boutiques and art galleries, if you want to pick up any souvenirs on your day trip. Just feel like window shopping? The walkable district is a prime place for a self-guided art, history, or hidden gem tour. Now that’s something to cheers about. For more tour information, mosey over to https://yaletowninfo.com. Cap the day off with a concert at the Orpheum Theatre, the prime concert venue for the Vancouver Symphony Orchestra. The third largest symphony orchestra in Canada has been around since 1919 and operates under the direction of a music director and conductor laureate. The dress code calls for casual attire, unless it is a gala evening. A stone’s throw from Robson Street, bordered by False Creek and Homer street, Yaletown is the historical site of the Canadian Pacific Railway. The former industrial area has been converted into a densely populated neighbourhood with trendy shops, bars and restaurants. Yaletown’s many heritage and industrial sites bear witness to the city’s past. A few minutes from Yaletown (800 Griffiths Way) is the home of the Vancouver Canucks. Close to the Sky Train station, Rogers Arena is more than a sports venue. In 2001 it hosted the World Figure Skating Championships and in 2010 the Winter Olympics. It has been a concert venue for artists like Bryan Adams, Janet Jackson, the Spice Girls and also a missed venue for Guns N’ Roses Axel Rose who failed to show up at his own concert. Pick up a gift at the Canucks Team Store from an assortment of brand name sports attire for Canucks fans like Nike and Under Armour, to name a few, or have lunch at one of the food kiosks and restaurants in the arena. Several attractions are free – budget about $150.00. Head over to Vancouver’s historical city core in the north east end of downtown. Named after “Gassy” Jack Deighton a captain from Yorkshire, the town used to be the bustling trade and commercial centre. In the 1930s Gastown was a liquor and beer guzzling hangout with hundreds of watering holes. It was headed toward a slow but steady decline until the 1960s. It was then that groups of citizens rallied to have the neighbourhood preserved. Amidst riots between the police and groups of counterculture hippies who were concerned with preserving the historical character of the neighbourhood, Gastown finally became a designated National Historic Site years later, in 2009. Today Gastown is an eclectic mix of upscale hip fashion shops, art galleries and run down houses with more or less “known” secrets and a history of its own. Water Street is the place to find Canadian souvenirs. Go for a bike ride across Lion’s Gate Bridge for more spectacular views of the city. The 1,823-metre, 3-lane suspension bridge connects Vancouver to the city’s North Shore district. This is a great place to catch more photo perspectives of the mountains. Many would argue that the bridge itself is nothing to boast about. It’s all about the city views – therein lies the beauty of Lion’s Gate Bridge. The pristine, unspoiled landscape of this area of Greater Vancouver is what Canada is all about. Lakes, mountains, forests and wildlife. On a clear day you can see Washington State’s Mount Baker from the mountain top. Anyone driving to the area will be happy to know that there is no charge for parking. There are trails for summer hiking and slopes for downhill and cross-country skiing. The non-profit Theatre under the Stars (Malking Bowl, Stanley Park) society puts on entertaining musicals and shows for the whole family like Shrek and Legally Blonde. The on-site café serves a limited menu of burgers (including veggie burgers), hot dogs, a few wraps, popcorn, ice cream and cold drinks. Tickets for adults are CAD$30.00 and CAD$45.00, depending on which seat you choose, children pay CAD$30.00. Situated near Stanley Park (750 Hornby St) the Vancouver Art Gallery is a great place to learn about Canadian art and the influential Group of Seven that shaped the country’s artistic landscape – in every sense. The museum also houses a collection of works by British Columbia’s Emily Carr. Adult tickets are CAD$20.00, families with 2 adults and no more than 4 children can purchase a pass for CAD$50.00. The meticulously landscaped grounds and multi-coloured mosaic of flower varieties are the main attraction of the park. Perched on Vancouver’s highest point, at 152 metres above sea level, this is another beautiful lookout point for stunning city views. Queen-Elizabeth-Park is about 20 minutes from downtown with public transportation. The oversized cherry tree, “dancing” water fountains, sculptures, the Bloedel Conservatory, arboretum with exotic trees, leash-free dog areas, tennis and lawn bowling areas make it worth the trip. The park is free. Entrance to the Conservatory is CAD$6.50 for adults. Jericho beach is known for its beautiful sunsets and if you’re lucky you will only find handful of people. This important eco-region is home to bald eagles, seals and various species of water fowl. A great way to end the day Arts Club Theatre Company (Stanley Industrial Alliance Stage, 2750 Granville St) is a favourite among locals and tourists for small productions like Mary Poppins, Les Miserables, Red Rock Dinner, comedy and high calibre cabaret productions. The largest theatre company in Western Canada stages five productions at the Granville Island Stage intimate 440-seat theatre and at other British Columbia venues. Depending on the seat location in the theatre, ticket prices range from CAD$39.00 to CAD$84.00. Cross Lion’s Bridge to reach Capilano River Regional park but avoid getting caught during rush hour. The camping rate per night is about CAD$70.00, but it can get crowded during the high season, so be prepared to share your campground with unknown neighbours. There is so much to do here- visit the salmon hatchery, trails and take Fido for a walk at one of the leash optional parks. If you dare, cross the river on the 137-metre Capilano Suspension Bridge suspended high above the rain forest for a once-in-a-lifetime experience. The Treetops Adventure is a walk among the treetops along a series of suspension bridges 110 feet above the forest ground. The admission price for the bridge and other park attractions is CAD$36 for adults. Parking costs CA$5.00. Grouse Mountain is a 3.8 km drive from Capilano Park. Head southwest on Capilano Park Road toward Pipeline Trail then turn left on Capilano Road, continue on Nacy Green Way, make your way toward Grouse Mountain. 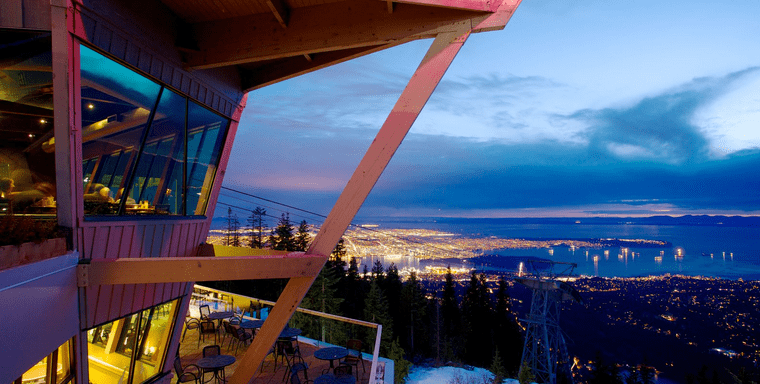 Enjoy a day of skiing at one of Vancouver’s most visited mountain attractions, then relax at the lodge near the gondola station where you can refuel at the cafe or restaurant or watch a wildlife movie. If skiing isn’t your thing you can skate, snowboard, or take your kids for a sleigh ride. You can learn about the local wildlife and get a glimpse of the animals at the sanctuary that the park runs. Several orphaned animals or retired from a life of exploitation in the film industry have found their home in this corner of paradise thanks to Grouse Mountain Resorts Ltd. All Experience tickets are the most economical way to enjoy all the attractions in the park for CAD$56.00. These prices change considerably depending on the attraction and/or activities you choose. The area abounds in wildlife that visitors can watch with expert wildlife guides. Resident and transient whales and other marine wildlife are just a few of the fascinating creatures that inhabit the local ecosystem. You will need at lease CAD$200.00 for all the wildlife tours including whale watching. Few people know that Jimi Hendrix spent part of his childhood in Vancouver where his grandmother worked as a cook at the former Vie’s jazz club (796 Main St). This is a real treat for Jimi’s fans and classic rock music aficionados. Visitors can view Jimi’s memorabilia and other objects that trace the rock legend’s roots. There is no charge but donations to help keep the shrine alive are welcomed. British Columbia’s capital is definitely worth a visit. Once you are there don’t miss any of the verdant parks, hiking trails, world-class golf courses, informative museums and beautiful heritage sites. Visit Butchart Gardens or embark on a wine tasting tour through Victoria and the Gulf Islands. Vancouver is a sleek glass and steel urban sprawl immersed in an unbelievable natural setting. The natural setting and quality of life make this a coveted destination for tourists and retirees. The spectacular scenery surrounding the city is also a favourite destination of nature lovers. *All rates and prices in this guide are subject to change without notice. Always check rates and prices with each company or service provider. Ensure CDN/US Dollar currency amounts when crossing Canadian-US border. Alternating between densely urbanized areas and the Zen environment of nature, Vancouver's natural landscape is the breathtaking backdrop surrounding a steel and concrete metropolis.